Note: HRS recommends using Internet Explorer or Mozilla Firefox as your browser when using WebKiosk. It is a good idea to add WebKiosk to your Favourites so you can easily find it later. You can find various instructions for WebKiosk via the Human Resource Service Portal. If you are having lots of trouble, contract HRS at hr-services@une.edu.au or on 02 6773 3705. 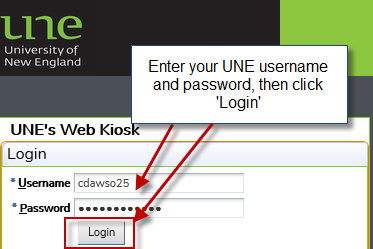 Enter your UNE username and password. Once logged in, you will see the WebKiosk Home Page. The section on the left side of the screen is your gateway to accessing all of the features in WebKiosk. 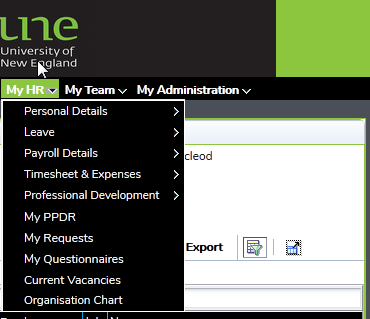 This shows you all of your current Jobs; you can access this by clicking the ‘My Details’ row (located above ‘My Favourites’). Certain tasks, such as making a training request, are ‘Job Number specific’, this means that you need to click on the job number that your request relates to. This section is how you can access all the main features of WebKiosk such as personal details, leave bookings, timesheets and payslips. This menu is for supervisors/approvers. 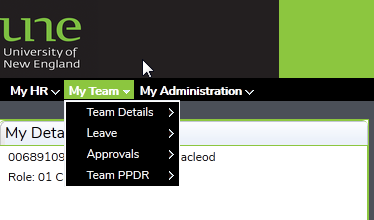 Functions such as team information, leave approvals, timesheet approvals and approval delegations can be accessed via this section. This section relates to recruitment. Staff involved in recruitment will be able to access applicant details and application documents via this section.